More than 100,000 signatures from supporters of a ballot initiative that would pave the way for San Diego State University to acquire the SDCCU Stadium property for campus expansion were certified by the city clerk, paving the way for the measure to appear on an upcoming ballot, organizers announced Thursday. Now, the City Council will discuss the initiative at an upcoming meeting. The Municipal Code stipulates that the council can consider adopting the measure or send it to voters. The group submitted 106,134 voter signatures for verification by the clerk; 71,646 verified signatures were needed. A competing initiative, which would result in a soccer-centric commercial development, recently qualified and will go onto a 2018 ballot. If both SDSU West and SoccerCity are approved by voters, the one that receives the most votes would be adopted. School officials in the fall outlined their vision for the project, including 1.6 million square feet of classroom and research buildings, a river park and open space, 4,500 housing units, retail shops, a pair of hotels and a multi-use, 35,000-seat stadium for college football and other sports. 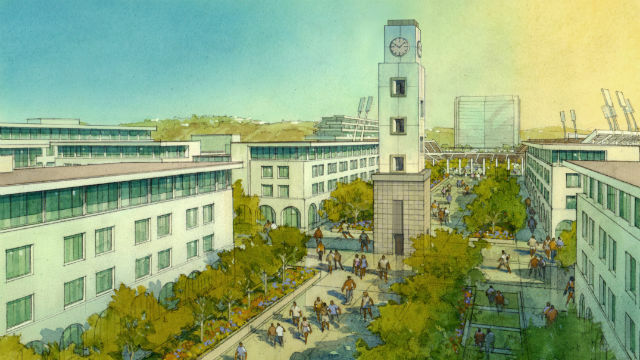 SDSU interim President Sally Roush and JMI Realty CEO John Kratzer have said the project would be mostly funded by public-private partnerships, and wouldn’t rely on taxpayer financing. The main exception would be the stadium, which would be funded by bonds to be paid back by future revenues. Nick Stone, project manager for SoccerCity, said he’s looking forward to public debate over the two proposals. “After all is said and done, we believe voters will choose SoccerCity, which offers something for every San Diegan, including plenty of room for SDSU to grow, a sports and entertainment district, and a massive river park, which will be built and maintained without a dime of taxpayer money, unlike the developer-written SDSU West proposal,” he said.